After hearing so much about Crazy Love: Overwhelmed by a Relentless God, I picked up my copy for the Amazon Kindle . The book itself is a quick read, so I intentionally slowed down to read it over a few days. Crazy Love: Overwhelmed by a Relentless God is one of those books to linger in, to dwell on it, one chapter a day as part of your devotional life. To go faster than that will miss the point of the challenges that Chan puts forth. To rush through the reading of this little book will cause you to miss out on the calling that it gives – to consider how to live for God: sacrificially, and completely sold out to Him. The first three chapters are some basic reminders of our theology, while the remaining chapters are a call for Christians to examine themselves in light of that. Read the opening chapters too fast and you’ll miss the point of the later chapters. I’ve talked with churches that will use it as a small group book, and the book points to supporting multi-media material on a dedicated website to help that process happen. The big take away challenge is how do we live sacrificially without being irresponsible? Chan doesn’t dictate what that has to look like in your life, but he pushes you to think. He doesn’t give a specific response like give a year of your life savings away, or commit to praying for a year, but to take the time to ponder how can you live on God’s mission. What might it look like if we lived our lives as fully devoted followers of Jesus? What can we do to make this life count for the Kingdom of God? What does it mean for the Walker family to give itself away in mission? How does our lifestyle demonstrate our radical commitment to following Jesus? How Crazy Love might help with Evangelism. The book itself is not intentionally evangelistic – it is written for the church and to the church. 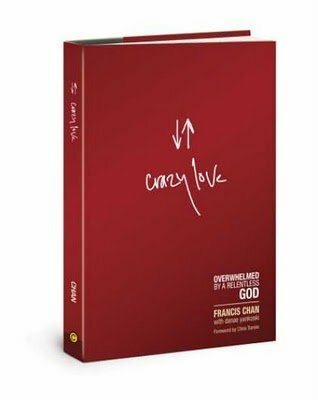 Crazy Love: Overwhelmed by a Relentless God is a book clearly aimed at helping Christians evaluate their own life and participation in the work of the Kingdom of God. Many modern gospel presentations focus on the benefit of eternal life, forgiveness of sins, and other matters of a personal or individual relationship with God. What many short presentations lack (or omit for brevity) is a kingdom vision – how to live to your life as a disciple. It’s often “say a prayer and your in.” We don’t always share the call to radical discipleship that should follow. we can present our lives as evidence of that discipleship transformation. We have something we can call people into – to give their lives away now in following Jesus. If we remain simply passive church-going Christians who lack that kingdom vision, our lives give nothing to emulate. Our passion to follow Christ isn’t visible, and Christianity remains mental agreement to a set of propositions. Chan reminds us in Crazy Love: Overwhelmed by a Relentless God that following Christ calls us to give ourselves away in service for the Kingdom of God. As we do, we can’t help but share the wonder of who God is, the motives of our service, and find the joy of inviting people to join us in transforming the world as followers of Christ.